Our DS1 Archive Boxes are so good we want everybody to be able to use them and see how good they are for themselves. That’s why we supply our Archive Boxes to everyone! Whether you are currently utilising any other of our Document Management services or not. DataSpace DS1 Archive Boxes come in packs of 15 flat pack boxes, they are very easy to assemble and we even have created a handy video to assist you with building the boxes. This video is available on our YouTube channel click here to view. By using DataSpace DS1 Archive Boxes you will be taking extra measures to protect your files and records during transit and storage. Our Archive Boxes are perfect for storing paper files as well as loads of other items – so why not get some to store your Christmas decorations or if you’re super organised why not use a DS1 Archive Box to hide presents you’ve already bought for Christmas – nobody will ever think to rummage through your Archives to find their Christmas prezzies! DataSpace’s Archive Boxes are specially designed with features including strong handles, tri skinned thick cardboard that provides the extra protection and security for your items. As well as being a great quality our Archive Boxes are competitively priced too! P.S As well as selling Archive Boxes we can securely store them! DataSpace’s purpose built Storage facilities are monitored at all times by online CCTV and are compliant and accredited to BS5454. 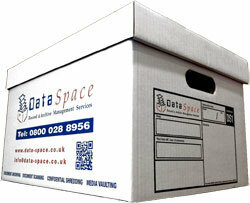 Utilising DataSpace’s secure Storage Facilities will give you more space within your working environment.